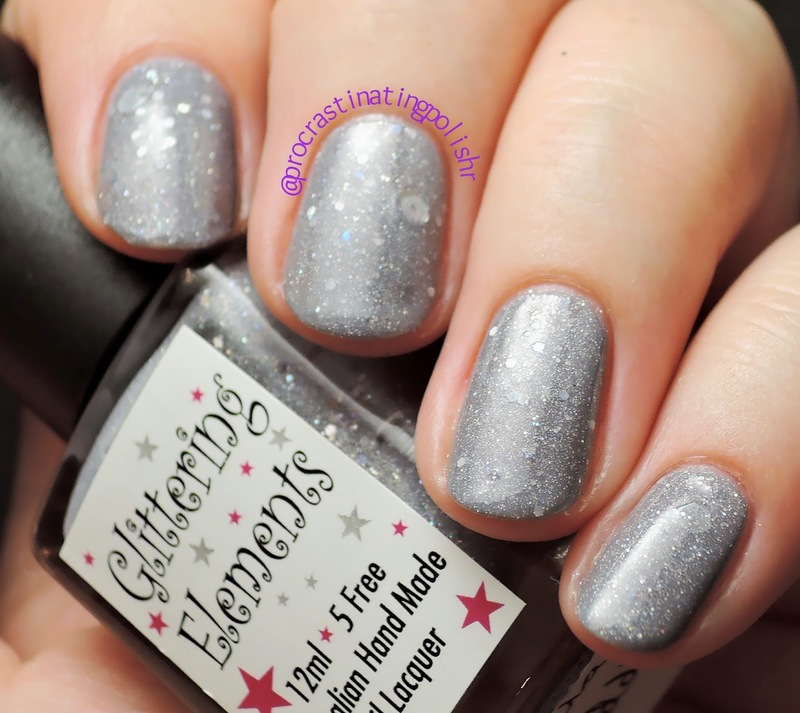 I have three stunners to show you today from previously untried Aussie brand Glittering Elements. I'd had my eye on one of these and after some excited enabling from my polish buddies I finally placed an order! I had decided to get three polishes and Adoration was the last I chose. It's not something I would usually be drawn to but it looked too unique to pass up. This polish is so complex, it is definitely completely unique in my collection. The base is a lavender/grey leaning taupe that I was a little worried about with my skin tone when I started applying it. Then when the pink squares, copper hexes and amazing lilac/blue glass fleck shimmer starts building up all that worry disappears. 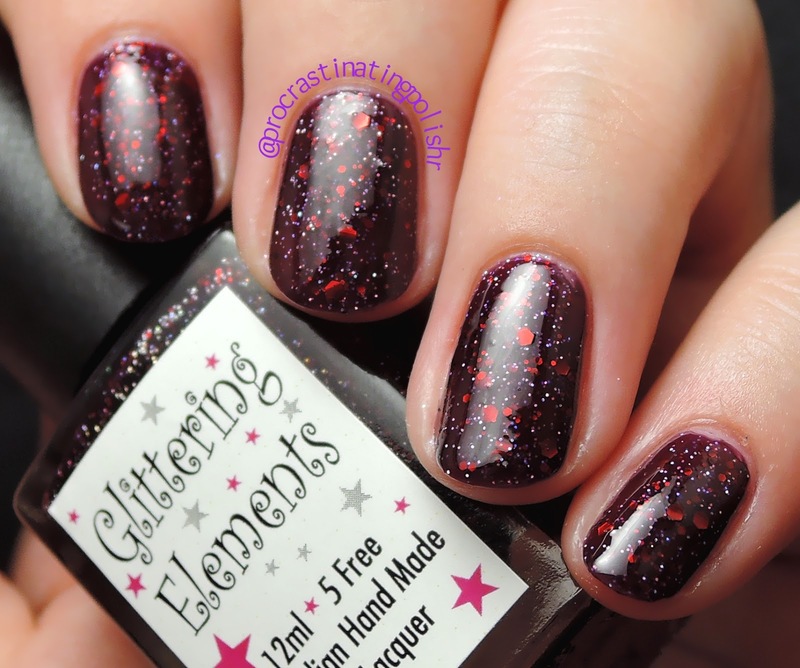 It all just works, and the formula is easy to use with no manipulation needed to get the glitters sitting nicely. It wasn't until I got it under a good bright light that I noticed the translucent looking yellow gitters in there as well. I'm amazed how all the colours play together so well! Now this - this I did not doubt for even a microsecond. 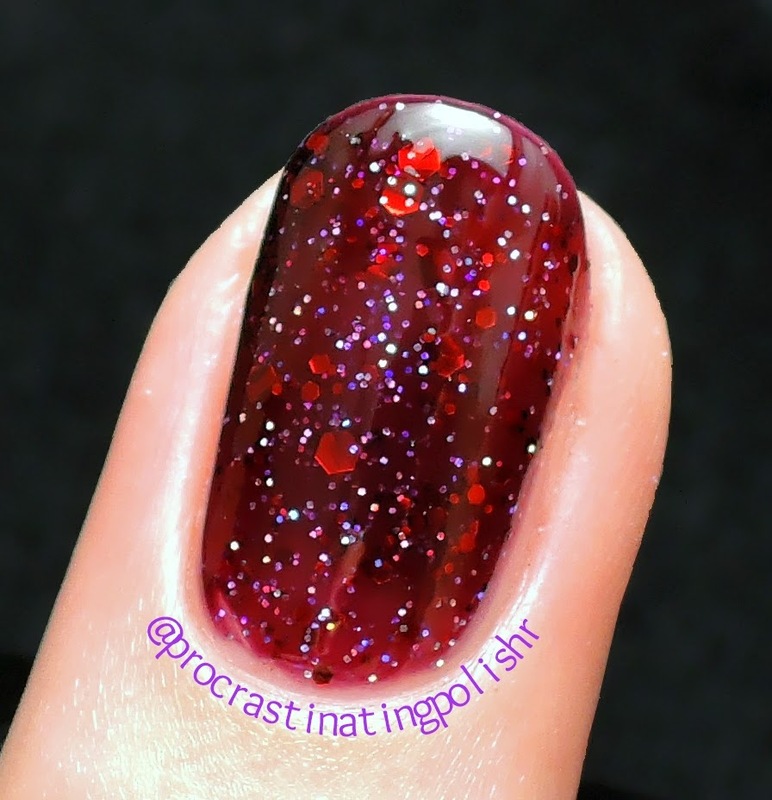 A deep bruised red jelly with red hexes and tiny holo glitters, you needn't even ask if I love it. But I'll tell you anyway - I LOVE IT! I was really worried with the first coat as the polish seemed quite thin and patchy, but by the third coat it had built up to squishy perfection. This is everything I could ask for in a horror inspired polish with a name like Blood, Guts, Gore & Glitter. Bonus: it only needed one coat of top coat to get a nice smooth finish! Even despite my hatred of forced alliteration I had to go for Koala Kuddles. Grey polish is always a bit of a weakness, plus it's not a colour you see in most releases. This was my least favourite of the three. It was close to needing four coats though I got away with three because my nails are short enough at the moment. I also found the large hexes needed to be fished out - I'll probably sit this one upside-down for 5 minutes beforehand next time I use it. What I do love about this is the colour - it's a nice cool grey that isnt too blue or pale. 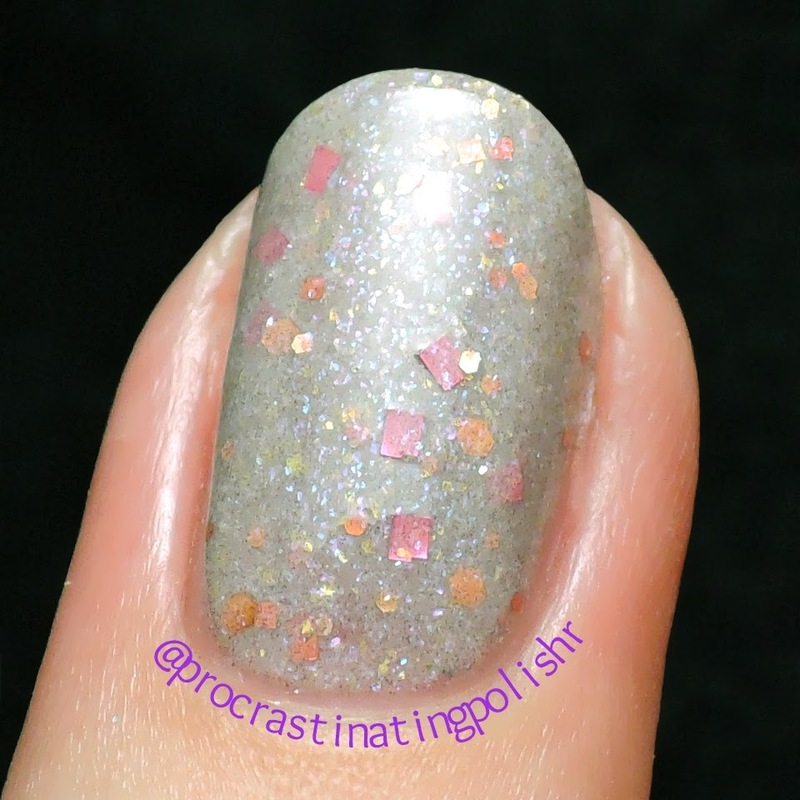 The smaller holo hexes and fine iridescent shimmer are a nice addition and give the grey a bit of life in direct light. 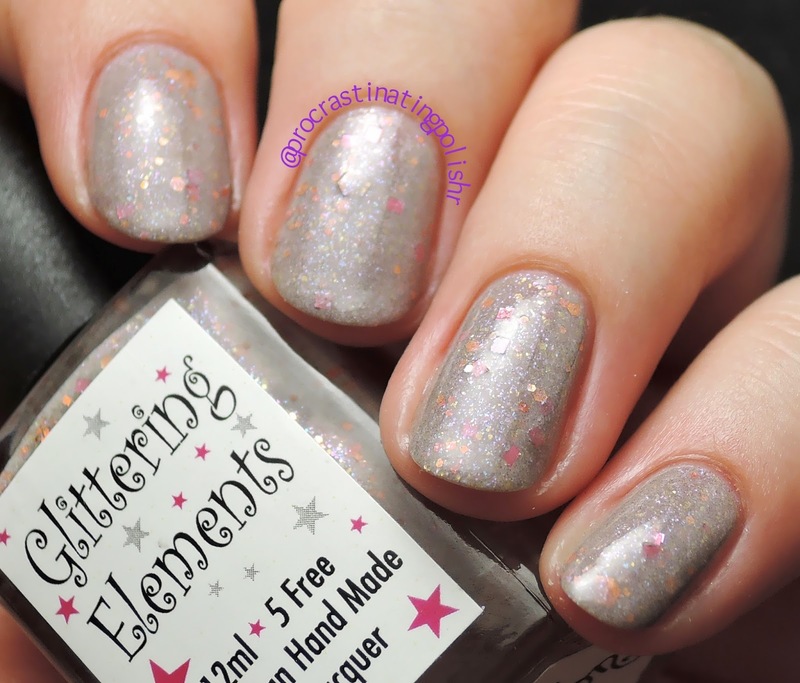 So I'm now officially adding Glittering Elements as a brand worth following, I will absolutely be checking out what's in store for them next year and maybe playing catch up with some shades I passed over with my self imposed 3 bottle limit. The Glittering Elements Etsy store is currently closed but will be reopening soon - keep an eye on their Facebook page for more info!